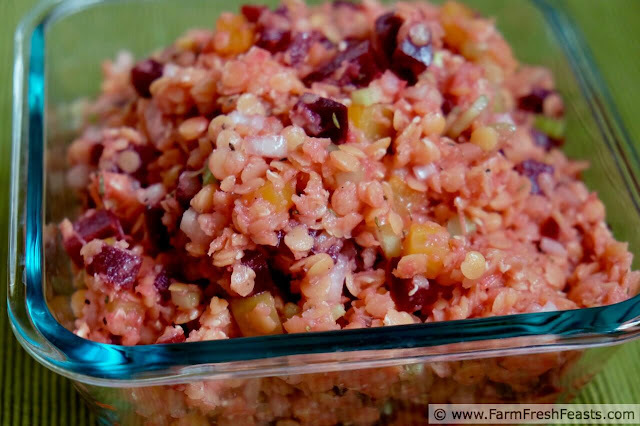 A hearty salad of red lentils and beets in a lemon thyme vinaigrette. This vegan recipe is a healthy addition to a summer pot luck because it keeps well at room temperature. Salads are staples in our fridge in the summer. It doesn't seem to matter the base of the salad--lettuce, kale, potatoes, or grains--having a salad is a go to alongside grilled vegetables and proteins. Something that can be prepared ahead of time is a great way to round out a meal when you're busy working at the grill on the entree. 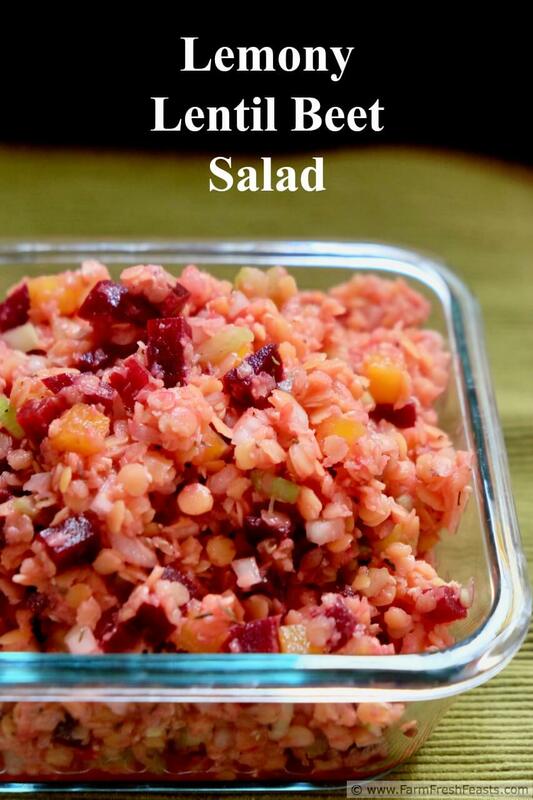 This blush colored salad is a colorful cool addition to a picnic. 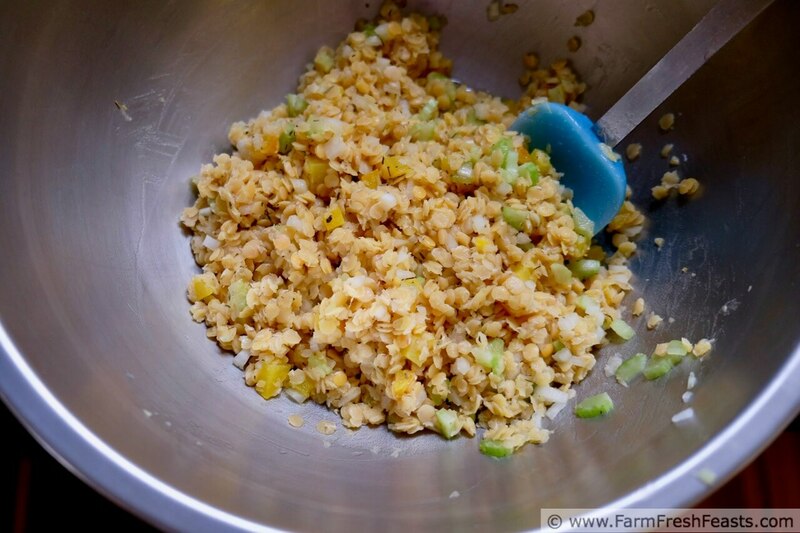 Since the dressing is made of lemon juice and olive oil, it can sit out at room temperature for quite a while safely. For leftovers, I like to mix in a bit of hummus for a quick version of my Layered Summer Appetizer. If you need to bring a salad to a pot luck, something that can hold at room temperature is a great idea for summertime. It provides a change of pace from mayonnaise-based potato salads, a gluten free option from macaroni salads, and a vegan option to bacon-topped tossed salads. I came up with this salad as a 'clean out the pantry' type meal. My inspiration for the dressing came from a lentil rice salad in the Better Homes cookbook, and I grabbed what vegetables from our Community Supported Agriculture (CSA) farm share were handy. 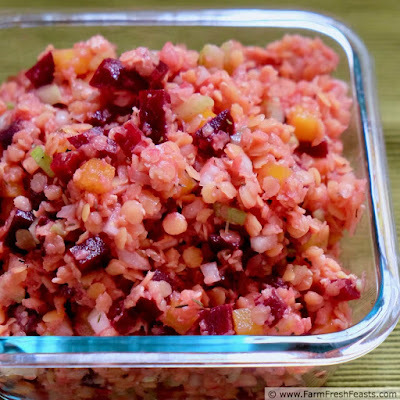 In this instance, red and golden beets along with celery and onion form the veggie component of this salad. It's got nice crunch from the celery, and the tender beets and lentils round out a forkful of flavor. I kept this salad for 3 days in the fridge without a problem, and I think it was better after sitting for a day. For more recipes using beets, please see my Beet Recipes Collection. For more recipes using lentils, please see my Recipes using Legumes (Beans) Collection. These collections are part of the Visual Recipe Index by Ingredient, a resource for folks like me eating from the farm share, the farmer's market, the garden, the neighbor's garden, and great deals on ugly produce at the grocery store. A hearty salad of red lentils and beets in a lemon thyme vinaigrette. This vegan salad is a great addition to a summer pot luck because it keeps well at room temperature. 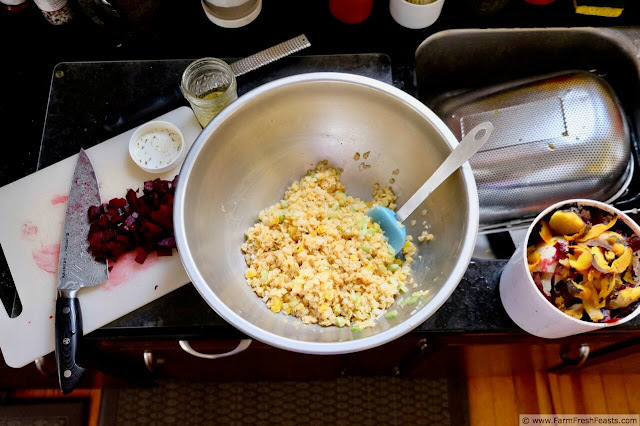 Combine cooked and cooled lentils, onion, celery, golden beets and lemon zest in a large bowl. Set aside red beets for now. In a screw top jar, combine lemon juice, olive oil, ½ teaspoon salt and thyme. Shake well. Pour dressing over vegetables and beans, and toss to combine. Add red beets to bowl. Toss to incorporate (the salad will become blush colored). Taste and decide if you'd like pepper and some additional salt. Chill for at least one hour.